St. Stephen’s Cathedral is the large and famous church in the centre of Vienna. 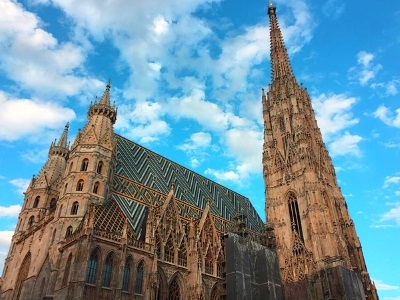 It is the most important church in Austria and one of the top sights of Vienna. Hardly any tourist comes to Vienna and does not go to St. Stephen’s Cathedral. A small part of the interior of the church can be visited free of charge. If you really want to see something, you need one or more tickets. Beside the church itself, one can also have a look at the cathedral treasure, two of the four church towers and the famous catacombs of the Stephanskirche. Catacombs: 6 Euro (2,50 Euro). This is the price for one of the frequent guided tours, the St. Stephen’s Catacombs can only be visited during a guided tour..
Aisle on the Steffl Tower (stairs): Admission 5 euros (1.50 children). This is the high church tower of the Stephanskirche. Lift to the North Tower (smaller Adler Tower): 6 euros (2.50 euros). At the top is the so-called Pummerin, with a weight of about 20 tons the largest bell in Austria. The sights listed above are open from 9:30 to 17 o’clock. Since a church service takes place in the St. Stephen’s Cathedral on Sunday and on public holidays in the morning, the opening hours on these days are shortened to 13:00 to 17:00. Generally it is better to visit the Stephanskirche in Vienna during the week in our opinion than at the weekend. Then there will be far less crowds. Only 2-3 minutes walk from the cathedral is the Mozart apartment Vienna. Mozart lived here for several years. The famous Spanish Riding School in the Vienna Hofburg is just 10 minutes away.